At Golden Hill Garage, we understand that buying a new car can be very stressful and can also be a costly mistake making the wrong choice, we will gladly help you find the car you want in the colour you want and even help you to find the lowest finance rates too. What is Personal Contract Purchase? Compared to the atrocious experience I had a month ago at a large main deale not far away, this was chalk and cheese. No sharp-witted dodgy 'geezers' here, just a lovely bunch of nice, knowledgeable and helpful guys, selling a decent range of good quality cars. No pressure selling and everything they told me about the deal and the car before I arrived turned out to be spot on, so my journey (1100 miles as it happens; don't ask) was, for once, not wasted. After two failed attempts elsewhere I got the car I wanted in the condition I wanted and at the right price, and the whole process was painless and hassle-free. 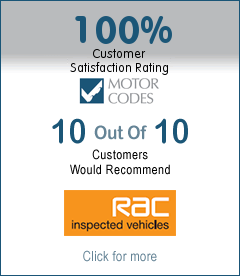 Can't recommend these guys highly enough; they are a credit to the motor trade - not an easy thing to say these days. They made a 2200 mile round trip worth the effort!